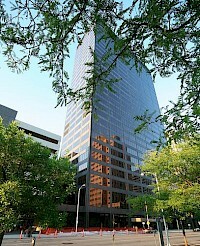 110 N. Main Street is an office tower located in downtown Dayton, Ohio. The building is 328 ft (100m) tall. 110 N. Main Street has 20 floors and was completed in the year 1989. 110 N. Main Street was once known as Fifth Third Center before Fifth Third Bank moved to the One Dayton Centre in 2009. Fifth Third Center is a high-rise office tower located in Downtown Dayton, Ohio. The building is 102 meters tall (336ft.) The most noteworthy tenant is Fifth Third Bank. The building was once known as One Dayton Centre until Fifth Third Bank moved into the building in 2009. The tower has the following amenities: Located within the tower is a restaurant called Super Subby's. Along with a restaurant, there is a Wright-Patt Credit Union and a FedEx office. 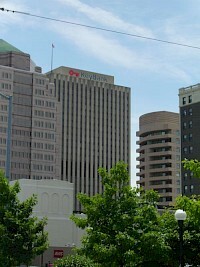 The Kettering Tower is a skyscraper in Dayton, Ohio. The Kettering Tower was built in 1970 and currently is the tallest building in the city. 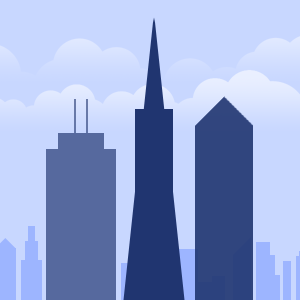 Lorenz Williams Inc. is the firm who built the building. Kettering Tower has 30 floors is 124 meters or 405 feet tall. The Kettering Tower has its own zip code: 45423. The building opened for business in 1972. It was a culmination of the vision of Eugene W. Kettering, the son of Charles Kettering, prolific inventor and founder of Delco Electronics Corp.
KeyBank Tower is a skyscraper located in Dayton, Ohio. Its address at 10 West 2nd Street was the first official name of the structure. The building was once named MeadWestvaco Tower until KeyBank gained naming rights to the tower in 2008. The tower has 27 floors and is 117 meters or 385 Feet tall. This KeyBank Tower is not to be confused with Key Tower in Cleveland, Ohio.